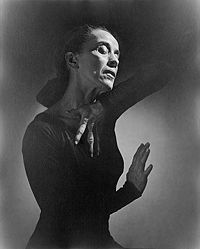 Martha Graham (May 11, 1894 - April 1, 1991), an American dancer and choreographer, is known as one of the foremost pioneers of modern dance. Building upon the foundation of turn of the century dancer, Isadora Duncan, Martha Graham would take this art form to a new level with her introduction of dance techniques that at first horrified and then later won over the American public. An innovator in her field, she has been compared to Picasso, Stravinsky, and Frank Lloyd Wright. Like other modernists she broke with the formalism of nineteenth century Romanticism in order to create not only a uniquely contemporary style, but one that was quintessentially American. Her philosophy, which helped shape the American public's view towards dance, was that "dancing is an affirmation of life through movement." Her bold and transformative work cannot be limited only to dance, however, as she also exerted a marked influence over set design, costumes, and music. President Gerald Ford called her "a national treasure," awarding her the first Presidential Medal of Freedom ever given in 1976. In 1998, TIME Magazine listed her as the "Dancer of the Century" and as one of the most important people of the twentieth century. Martha Graham was born in Allegheny, Pennsylvania. She was 14 years old when her family moved to Santa Barbara, California, in search of a more favorable climate for her sister's asthma problems. The liberal cultural milieu of the West Coast had an impact on Graham's career choice. After seeing Ruth St. Denis perform in 1910, she proclaimed that her future profession was "chosen" for her. Her father, initially discouraging her, allowed her to attend Cumnock Junior College in Los Angeles, which placed an emphasis on the arts. In 1916, at the age of 22 (a very late start for a dancer), Graham was finally able to pursue her interest professionally by enrolling at the school St. Denis founded, along with husband Ted Shawn, called the Denishawn Studio. She spent eight years there performing, teaching, and embarking on a longtime collaboration with Louis Horst, who would become her musical director and adviser. In 1923, seeking to branch out into a career of her own, Graham performed with the Greenwich Village Follies on Broadway for two years. Then in 1925, she took the position as dance instructor at the Eastman School of Music and Theater in Rochester, New York. She was given complete control of her classes and an opportunity to do experimental work. It is from this pool of students that she first drew upon to create a performing ensemble. Initially, her dance group was made up entirely of female dancers, but later she introduced male dancers, opening the way for more diversified performances. She would also be one of the first directors to employ Asian and African American dancers. In 1926, Graham founded her own company, the Martha Graham Dance Company. (Now known as the Martha Graham Center of Contemporary Dance, it is the oldest modern dance troupe in the world.) Her unique style of movement, which incorporated spastic tremblings, floor work, and tumbling falls provided a unique counter-pose to the flying leaps and highly structured balletic style that was the mainstay of dance in Europe. Graham, initially ridiculed by American audiences, became widely recognized for her expressive style that more intensely conveyed spiritual and emotional themes. The Chicago Tribune said of her art, "by creating dances that probed so deeply into the human psyche, Miss Graham established a new vocabulary for dance in America." Part of Graham's success can be attributed to the highly creative collaborations that she engaged in with other artists, such as with sculptor Isamu Noguchi on sets. Both set and costume design were spare and minimalist in contrast with more traditional dance and theater productions. Graham sometimes commissioned musical scores for her pieces by notable composers, such as Aaron Copland, who collaborated with her on Appalachian Spring, the story of a pioneer wedding. She drew inspiration—what she called a "certain stirring"—from American writers, Nathaniel Hawthorne and Emily Dickinson (Letter to the World), and from Native American rituals, Biblical stories, and historical figures. In the 1930s, nearly half of her dances were solo; the most publicized one was performed at the White House in 1937, for President Franklin Roosevelt and First Lady, Eleanor Roosevelt. This short program drew attention to her newly emerging and important role in the establishment of modern dance in America. Graham would go on to dance for seven more presidencies. A tour through the American southwest provided her with the inspiration for Primitive Mysteries (1931), a work that reflects both her interest in Native American stories and the art and imagery of painter Georgia O'Keeffe. That same year she would be the first dancer to receive a Guggenheim Foundation Fellowship. In 1936, Graham refused to perform at the Olympics in Berlin due to Nazi Germany's persecution of fellow artists. Instead, she immersed herself in the creation of one of her defining works, Chronicle, which became a statement against imperialism and signaled a new beginning in an era of contemporary dance. The dance brought serious issues to the forefront with renderings from American history that included the Wall Street Crash, the Great Depression, and the Spanish Civil War. In the 1930s, Graham taught at Bennington College summer school, where future First Lady Betty Ford took classes from her, and at New York University, where Martha Hill directed the dance departments. Graham was also a founding member of the dance division of the Julliard School. The 1940s were highly prolific for Graham when she produced many inimitable works, such as American Document, which featured principal dancer Erick Hawkins, who would later become her husband. (They married in 1948 and divorced in 1954.) This passionate dance recited passages from Solomon's "Song of Songs" and contrasted them with the rebuking words of Puritan preacher Cotton Mather. What could be considered her magnum opus was the production of Seraphic Dialogue (1955), which told the story of Joan of Arc. The re-enactment of women's struggles and victories throughout history was to be a recurring theme in Graham's work. This work in particular was seen by critics as a telling reflection of Graham's own professional triumphs over disappointment and failure. Her largest-scale work, the lengthy and other-worldly Clytemnestra, which drew from the poetic works of Robinson Jeffers, was performed in 1958, and featured a score written by the Egyptian-born composer Halim El-Dabh. Graham's dancing life gradually came to a rest starting in the 1950s. Graham's own final performance was in 1968, at the age of 75, in A Time of Snow at the George Abbott Theater in New York City. However, she would continue to choreograph, teach, and direct her company, for two more decades. In 1990, only a year before her death, her final piece was performed, Maple Leaf Rag, which featured the music of Scott Joplin and costumes by Calvin Klein. Although her creative powers waned in later years she was to receive many awards for her work. In 1965, she won the Aspen Award in the Humanities, which proclaimed that her work, "reaffirmed the primacy of the human spirit in an age dominated by science and technology." In 1979, she was a Kennedy Center Honors Award recipient. In 1984, she was invited to the Paris Opera by Rudolf Nureyev, where she received the French Legion of Honor Medal and in 1985, she received the National Medal of Arts. She died from pneumonia at the age of 96 in 1991. Martha Graham said that she wanted to be remembered primarily as a dancer, but her prodigious career of seven decades included much more—from choreography to teaching to costume design. She influenced a generation of dancers who have incorporated her revolutionary ideas about movement, which are based in part on her use of disciplined breathing techniques and the "contraction and release of energy," that so distinguished her work. She had enormous influence over the way modern dancers approach and think about movement in both form and content, and her ideas have become part of a permanent dance lexicon throughout the world. 1944—Appalachian Spring. Music by Aaron Copland. 1947—Night Journey. Music by William Schuman. 1948—Diversion of Angels. Music by Norman Dello Joio. 1950—Judith. Music by William Schuman. 1955—Seraphic Dialogue. Music by Norman Dello Joio. 1958—Clytemnestra. Music by Halim El-Dabh. 1960—Acrobats of God. Music by Carlos Surinach. 1960—Alcestis. Music by Vivian Fine. 1961—One More Gaudy Night. Music by Halim El-Dabh. 1962—A Look at Lightning. Music by Halim El-Dabh. 1963—Circe. Music by Alan Hovhaness. 1967—Cortege of Eagles. Music by Eugene Lester. 1969—The Archaic Hours. Music by Eugene Lester. 1973—Myth of a Voyage. Music by Alan Hovhaness. 1975—Lucifer. Music by Halim El-Dabh. ↑ "Martha Graham," Newsmakers 1991 (Gale Research, 1991). ↑ Contemporary Authors Online (Gale, 2007). Contemporary Authors Online. Gale, 2007. "Martha Graham." In The Scribner Encyclopedia of American Lives, Volume 3: 1991-1993. Charles Scribner's Sons, 2001. "Martha Graham." In Newsmakers 1991. Gale Research. 1991. "Martha Graham." In American Decades. Gale Research. 1998. Public Broadcasting System (PBS). 2007. Martha Graham: About the Dancer American Masters biography. John F. Kennedy Center for the Performing Arts. Kennedy Center biography. This page was last modified on 24 August 2018, at 15:04.